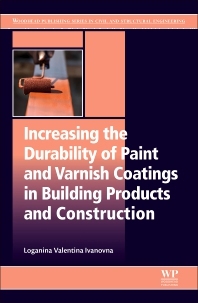 Increasing the Durability of Paint and Varnish Coatings in Building Products and Construction presents data and analysis on regularities in the appearance quality of protective and decorative coatings for building products and structures, also detailing the relationship between the resistance of coatings and the quality of their appearance. Developing a method for ensuring the quality of painted surfaces for building products and developing control methods is an important scientific, technical and economic problem. The conditions needed depend largely on the rheological properties of paint and the processes of wetting and application, with different variables for metal or concrete structures. Loganina Valentina Ivanovna is Doctor of Technical Sciences, Professor, and Head of quality control and construction technologies at Penza State University of Architecture in Russia. Her research interests include the development of finishing materials composition, and the forecasting of their durability. The author has published widley, has 70 patents, and and has supervised numerous dissertations and research projects.